In a bowl combine soy sauce, water, sugar, Worcestershire sauce, rice vinegar, onion power powder, and garlic powder whisking until sugar is dissolved. Transfer into zip top bag over chicken. Marinate for two hours to overnight. 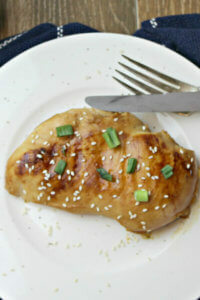 Grill for 12 to 15 minutes, until juices run clear and chicken is no longer pink.